"It is a mountain of rage, summoned to leave only destruction in its path." Might of Crota is a Hive Ogre found in Siege of the Warmind. It was sent to attack Rasputin with Omnigul, Will of Crota and gain control of his weapons, but it was defeated at the hands of a Guardian ended the Hive assault on the warmind. 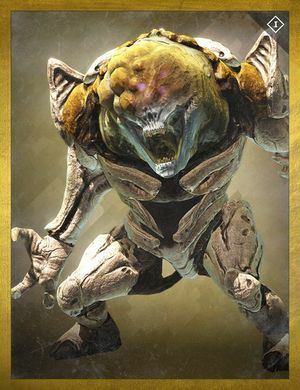 In The Taken King, it was revealed that it was a means to strengthen the Hive by creating an Ogre that not even Kagoor, a specialist in controlling Ogres, could tame. The Might of Crota is the second Ogre Ultra found in the game of Destiny, the first before it being Telthor, Unborn.